The Detroit Tigers were in desperate need of just one thing: bullpen help. Last year the Detroit Tigers showed they so desperate that were willing to give Jose Valverde the closer's job for a couple weeks rather than take Jonathan Papelbon off of the Phillies hands. Instead, they opted for an early exit in the playoffs and unrealized dreams. Yes, nobody wants Jonathan Papelbon. never seen player meet expectations & have as little trade value as papelbon. jays, astros, teams w/need, not interested. If Papelbon is "meeting expectations", then it must be about the money, right? "Its not just the money, but teams are afraid of the guy, can't put him in the clubhouse." - @jaysonst on Papelbon. If Papelbon is really that big of a problem, did he get this way while a member of the Philadelphia Phillies? Papelbon famously got suspended this past season for "adjusting" himself as he walked off the mound, and still denies it to this day. But the issues are within the clubhouse, something that the average fan will not be able to see. Howard Eskin of Fox 29 called Papelbon one of the "bad guys" in the clubhouse. Had the Phillies done their homework (even using Google), they may have realized that not many teams were going too hard after someone that was considered part of the clubhouse issues that led to former Sox manager Terry Francona's outster and Papelbon finding a new team. Back at Papelbon's signing in 2011, our pal Mike Frohwirth called the signing a "massive overpay". While the money itself is not an issue, and Frohwirth's other concerns at the time (tying up money that could go to others) has not proven to be an issue, either, Papelbon is stuck with the Phillies for at least 2015. Unless he gets hurt, he will likely be around in 2016, too, when a contract option vests. Papelbon recorded 39 saves with a 2.04 ERA in 2014 with only four blown saves. With 106 saves with the Phillies, Papelbon will likely become the Phillies' all-time saves leader in 2015, needing just six saves to tie Jose Mesa for a spot in Phillies history. Papelbon is an unlikely story of a pitcher performing extremely well in a time when pitching is scarce. And yet, no one wants him. When Oakland Athletics General Manager Billy Beane was on a conference call earlier this offseason, he said that third baseman and top offensive producer Josh Donaldson would not be traded. Then Alex Anthopoulous called. Soon the Toronto Blue Jays and the Oakland Athletics made a deal no one expected, sending Donaldson to Toronto and Brett Lawrie and three prospects to the Oakland Athletics. The Boston Red Sox entered the season with an outfield full: Rusney Castillo, Jackie Bradley, Jr, Shane Victorino, Yoenis Cespedes, Allen Craig, and Daniel Nava. Yet, that did not preclude the Red Sox from adding another outfielder into the mix in converted shortstop Hanley Ramirez. Will Middlebrooks, a promising young third baseman who had a bad year in 2014 was replaced by free agent Pablo Sandoval. There are plenty of lessons the Phillies can learn from these deals. When is the last time the Phillies traded a position player who was still performing when the team was NOT looking to rebuild to keep a steady stream of talent coming into the organization? Josh Donaldson at age 28 was still in his prime, and the Athletics got back a 24 year-old third baseman and three prospects. The Athletics sacrificed some offense at third base, but will look to make it up in other areas. The Phillies seem to get particularly attached to their players in their prime and feel they have to keep them forever. This is nothing new to the 2008 core; the 1993 Phillies were hanging around on the books through 1998, when Lenny Dykstra's contract finally ended. The Athletics still have a shot to compete in 2015, and have plenty of assets for upcoming years to tap into. Additionally, the Phillies should be on the hunt for players such as Donaldson in pursuit of a rebuild. The Toronto Blue Jays are getting four years of control of Donaldson before he is a free agent. Would a rebuilding team such as the Phillies benefit from a 28 year-old with a 7.4 WAR? Absolutely. The Phillies tend to get locked into the idea that they cannot upgrade a position if they already have someone who plays it. The right question to ask in any given situation is not, "What positions are vacant?" but rather, "What position can I upgrade?" Should the Red Sox have said, "We have Will Middlebrooks; there is no need for another third baseman?" and passed on Pablo Sandoval? Should the Red Sox have been satisfied with the defensive-but-offensively-challenged Jackie Bradley, Jr. and oft-injured Shane Victorino instead of signing Hanley Ramirez and Rusney Castillo? Should the Toronto Blue Jays have been satisified with Brett Lawrie and skipped getting Josh Donaldson? I think that question answers itself. The Phillies' roster is full of places to upgrade. Cody Asche put forth a 0.6 WAR in his first full season. Domonic Brown put together an embarrassing .634 and -1.4 WAR season. Ben Revere had a high batting average, but just a .686 OPS and 0.6 WAR. Do these three players have to be guaranteed positions for next year? If the Phillies have an bility to upgrade positions, they should. The Boston Red Sox only can carry four bench players. One of them has to be the backup catcher, and the American League benches are one fewer than the National League with the designated hitter, so the Red Sox have four spots to backup the infield and outfield. Daniel Nava surely will be a corner infield and outfield backup. The Red Sox need a second backup who can play shortstop and second base. So, from the list above and rookie Mookie Betts, multiple players need to go. Who will go? I am not sure that the Red Sox know yet. The Sox have some potential trade pieces in Allen Craig and Yoenis Cespedes to acquire pitching or prospects for later. The Sox took advantage of some free agent availability and has now given them extra assets. They will be able to move them, and they will be able to fill other holes later. They have all offseason to decide; because the Red Sox acquired extra talent first, there are more teams out there that need it. The Boston Red Sox won the World Series in 2013 and began rebuilding in 2014. Having money on your side makes it much easier. The Red Sox were able to add an international free agent in Rusney Castillo, who only cost the Red Sox money. While the Red Sox traded Jon Lester, they got pieces back in return. Guess who they are pursuing now, who only costs money? Jon Lester. If the Phillies did it right, they could trade Cole Hamels and sign an ace next season. If the Phillies got the right players back, they could sign David Price as a free agent. They could sign Jordan Zimmermann as a free agent. Both would be just 30 years old. Rick Porcello is a tick below them and will be a free agent at age 27. So, instead of just having an ace pitcher, they could have an ace pitcher and three building blocks. We are a week away from the beginning of the winter meetings. The Phillies still have pieces to deal, if they so choose. They had their run and it ended in 2012. Hopefully, they have learned some lessons to keep the team competitive in future seasons. They have the cash. The Phillies went from "strong contenders" to land free agent outfielder Yasmany Tomas to perhaps not even making Tomas an offer. After floating out the story that the Tomas' defense was a concern, the Phillies were not even among four teams who made Tomas an offer. While Phillies General Manager Ruben Amaro Jr. said that the Phillies were "not disappointed" that they did not sign Tomas, the greater disappoint could come if the Phillies were wrong on Tomas. The Phillies officially declared that the team was rebuilding, first by interim President Pat Gillick, and second by Amaro. But, what would the rebuild entail? Well, for one, they could trade their players for prospects. However, the market is not really such that prospects are being traded. With most executives overvaluing prospects, only Oakland Athletics general manager Billy Beane seems to be cashing in on this overvalue thus far. If you cannot rebuild, through trades for prospects, what is left? International free agents. If indeed the Phillies were concerned with Tomas' defense, then why were Tomas' suitors all National League teams? The defense was not a concern for the Atlanta Braves, San Francisco Giants, San Diego Padres, and Arizona Diamondbacks, who ultimately came to an agreement with Tomas. By not making an offer, Amaro is really putting himself on the line. While there are good arguments to the contrary, including this one from Corinne Landrey of CrashburnAlley.com trusting the international scouts, what if they get it wrong? The Phillies would have no trouble coming up with the $68.5 million that Tomas reportedly will receive over six seasons. Unlike other rebuilding options, such as trading ace starting pitcher Cole Hamels, all this young player would cost the Phillies is money. Since a rebuilding team no longer needs to spend near $16 million on an A.J. Burnett or a $8 million on a Marlon Byrd-type player the next couple years, there is plenty of money for Tomas. If Tomas signed and was a bust, all he would cost them is money. If the Phillies trade Cole Hamels and only get back another Phillippe Aumont, Tyson Gillies, and Juan Carlos Ramirez, the effects would be far, far worse. If Tomas was able to give them what Marlon Byrd was able to give the Phillies in 2014, they would have come out far ahead, someone to pencil into the lineup the next several years with some power from the right side. If the Arizona Diamondbacks get All-Star output from Tomas the next several years, the Phillies and their fans will only be able to watch and weep. Amaro will not be able to withstand the criticism if the rebuild goes south, particularly if he passes up the rare opportunity for an international free agent. The Phillies will not be able to buy their way out of this with older free agents and the risk of trading Hamels is that much worse. The Phillies should have given Tomas a shot; they had nothing to lose but all to gain. Amaro's job could depend on it. Less than a year ago, we learned that long-time Phillies broadcaster Chris Wheeler would be out of the Phillies broadcast booth. After a lengthy search in which Comcast Sports Net looked for a new broadcaster, Comcast setteled on former 2008 Phillies Jamie Moyer and Matt Stairs. After just one season, Comcast Sports Net announced that Moyer will not be returning. “At the end of the Phillies' season, I gave the situation a great deal of thought, with my family in mind,” Moyer said. “I enjoyed my year behind the mic tremendously, and the opportunity to work with Tom, Matt, Mike and Gregg is one I will cherish. “However, as we are now based on the West Coast, the geography presents unique challenges to the matter at hand. I thus reached a decision that, for the moment, it’s very difficult to balance a bicoastal professional life with family life at home. The report notes that the rest of the broadcast team would return for 2015. Chris Wheeler has to be somewhere laughing. After 37 continuous years of service, Wheeler was shown the door and it only took one season for another change. The report does not indicate if the Phillies will look for another color commentator, or if the Phillies will simply make do with Tom McCarthy, Matt Stairs, Gregg Murphy, and Mike Schmidt. Ruben Amaro on Tomas to AZ: "We are not disappointed"
Reports surfaced earlier today that Cuban phenom, Yasmany Tomas had agreed to a deal with the Arizona Diamondbacks. The deal, reportedly for six years for just under $70 million, is for much less money than anyone expected and Tomas ended up with a team that no one really even knew was in the running. Ruben Amaro had been in touch with Tomas' agent as recent as today, but did not say whether or not the Phillies remained in the final round for Tomas. Per usual, Amaro didn't have much to say about the matter, keeping his comments to a smug minimum. Amaro was asked if he was disappointed that Tomas would not be a Phillie. “We are not disappointed,” he said matter-of-factly. The Phillies were impressed with Tomas’ power, but sources say they had concerns about his conditioning and outfield defense, especially when weighed against the risks of his price tag and lack of major-league track record. With the hopes of signing Tomas now in the rear view mirror, the Phillies are, again, left with their aging lineup of veterans with little offensive consistency. Fixing that doesn't seem to be the direction the Phillies are headed either, according to the man in charge. 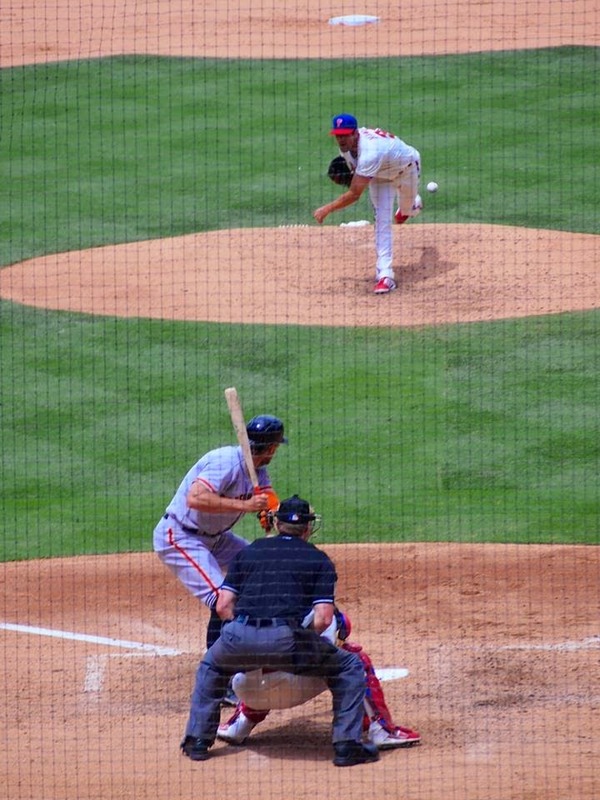 The starting rotation may indeed need a boost moving forward, especially if the Phillies find a suitor that offers a very good deal for Cole Hamels. With Cliff Lee's future in jeopardy, the rest of the rotation is made up of Jerome Williams and David Buchanan. For now, the offseason for the Phillies moves along without signing Tomas and with even more unanswered questions for the future. The Yasmany Tomas drama is over. The Phillies will be not signing the free agent outfielder that the Phillies were once called "favorites" on. The Phillies now will definitely be without Tomas in their outfield. Cuban outfielder Yasmany Tomas and the D-backs have agreed to a six-year deal worth $68.5 million, according to industry sources. The Tomas deal will include an opt-out after four years and is pending a physical, the sources said. The D-backs have not confirmed the agreement. The deal is much less than the $100 million mark many speculated he would get. The Phillies were concerned about Tomas' defense and supposedly "cooled" on the idea of Tomas in recent weeks. The Diamondbacks, already with Mark Trumbo in the outfield, do not seem to care. With Paul Goldschmidt at first base, Tomas will have to either play center field or left field. Source said only offer for Hamels came from club that has never been mentioned in media. Described offer as "good" but "not good enough"
We already know that Amaro is looking for a deal to blow him away for Hamels, because the Phillies GM doesn't feel inclined to trade him at all. The Phillies stance on Hamels has been just that, as they have not reached out to teams about him. Instead, haven't asked teams for their best prospects, but rather to just make them an offer. No potential offers, apparently, have come close. It seems more and more like the Hamels situation may end up in him being the Phillies Opening Day Starter, but one thing that is for sure is that a deal will have to wait until Jon Lester finds a landing spot. A few weeks ago we learned that Jimmy Rollins was not willing to go to the Mets in any trade, but did not necessarily rule out going elsewhere. As the offseason opened, we learned that the Yankees might consider Rollins to take over shortstop in place of the retiring Derek Jeter. Today we learned that the Yankees did indeed reach out to the Phillies. Rollins was never asked because it looks like the Phillies were not really willing to deal him. The Phillies do indeed have a replacement for Rollins: anybody. It does not really matter who replaces Rollins; in fact, simply clearing Rollins from the middle of the infield will give the Phillies a landing spot for a prospect they might acquire. If the Phillies were to make a trade with the Chicago Cubs, middle infielders are the most appealing prospects. For now, there is no one to put a newly-acquired shortstop in a trade. Better yet, the Phillies could sign 19 year-old free agent shortstop Yoan Moncada in free agency. Even if he is not ready yet, Freddy Galvis would do just fine making the plays on a rebuilding team. J.P. Crawford? He is no guarantee. Roman Quinn and J.P. Crawford remind me considerably of the "can't miss" duo of Rollins and Reggie Taylor. Only Rollins became something. Ignoring a potential building block just because someone several levels away plays that position is asinine. So, Jimmy Rollins will likely play the last year of his contract with the Phillies, and they will not re-sign him anyway. Or will they? The only thing more certain than death or taxes, it appeared, was free agent outfielder Yasmany Tomas signing with the Philadelphia Phillies. Since the Phillies were called the frontrunners for Tomas' services, even way back for that period of time people thought his name was spelled "Yasmani" many other teams have jumped into the bidding, while the Phillies reportedly were jumping out. [w]hile the Phils, who had a private workout with Tomas, still like his bat there are concerns about his defense. They now view him as more of a designated hitter-type player, the sources added. Of course, that thinking could change if the price for Tomas, once estimated to be as high as $100 million, begins to come down." And then, many other teams entered the bidding. Sources: Tomas weighing short- and long-term offers. If he took three-year deal, would become free agent at 27. If the Phillies were concerned about Tomas' defense and Tomas wanted a short-term deal for a free agency later, this could mean the Phillies and Tomas have a match. Yoenis Cespedes opted for this option three years ago; his four-year deal is less than the standard initial major league deal of six years. The other teams reportedly in on Tomas: the Arizona Diamondbacks, the San Francisco Giants, the San Diego Padres, and the Atlanta Braves. If defense is really a concern about Tomas, then why would so many National League teams be in on Tomas? The Phillies could have been using this as a negotiating tactic; the team who over the years committed the outfield to Greg Luzinski, Pat Burrell, Delmon Young, and Domonic Brown cannot be that worried about defense. The latest report about Tomas on mlbtraderumors.com does not even mention the Phillies. If another team in the National League signs Tomas, I will be very disappointed. After all, there are few chances to sign a young player with power, and this is it. All he will cost the Phillies is money. What Would We Get for Cole? The market for Cole Hamels is picking up. Even though that seems weird, it's true. Boston is now more sure of what it can move, and what it wants to spend. Los Angeles now knows what it needs. Others are now more sure of the market in which they are operating. Teams want to get deals done soon now, as merchandise selling season, and the winter meetings, are ahead. The Phillies would start by asking for Joc Pederson, an outfielder who is considered LA's top prospect. The alternative to Pederson is Corey Seager, the number two prospect, a shortstop with a good bat, who some see as a third baseman because of his very solid arm. Normally I'd say LA will go Seager, but the exit of Hanley Ramirez and an overly deep outfield make me doubt it. Next, the Phillies would have to get either Julio Urias or Zach Lee, the third and fourth rated prospects in the system. Urias, a lefty, is younger and further away, but has stuff that makes GM's drool. Lee has been highly rated for a few years, and is closer, but the righty 23 year old did not dominate AAA this year. Next, the Dodgers would without question attempt to get the Phillies to take a major league outfielder off of their hands. No, it won't be Puig, as the Dodgers will try to get the Phillies to take Ethier or Crawford off of their hands. Perhaps the Phillies would rather Matt Kemp, but I'd basically run from Ethier. Finally, the Phillies would probably take a fourth prospect in this deal as well, looking at the likes of five other pitchers in the Dodgers top ten, or high end athlete James Baldwin III. In short, I'd walk away thrilled with only three players if two of them are Pederson and Urias. I doubt LA will do that though, so if you get Pederson, take Lee, and if you get Seager, insist on Urias. My ideal outcome would probably be a Pederson, Lee, OF'er (obviously I prefer Kemp, but doubt that), and one of the other top ten arms. While I was very down on a deal with Boston, now that they've went on a spending spree, their willingness to kick in the extra prospect has probably improved. This deal should start a top pitching prospect named Henry Owens, a lefty who has now reached the upper levels of the minors. The alternative to Owens is another pair of lefties named Eduardo Rodriguez and Brian Johnson. The Phillies should stick on Owens though, as he is my favorite prospect in Boston's system. Next is the big position prospect, and there are many options here. Either Blake Swihart or Christian Vazquez are catching options, Mookie Betts could be considered an outfielder or second baseman, and Xander Boagerts could play at either left-side infield position. Betts as a second baseman is the most enticing to me of the group, followed by the catchers. Jackie Bradley Jr. and Will Middlebrooks could be considered in a potential deal as well. Consider them against other pitching prospects Matt Barnes and Anthony Ranaudo. Finally, Boston will almost certainly want to move someone from their crowded outfield. I'd obviously love for it to be Rusney Castillo, but that won't happen. You're looking at a Daniel Nava, Shane Victorino, Yoenis Cespedes type of field. If this deal is to happen, you have to get two of Owens, Swihart/Vazquez, Betts, and Boagerts, with a strong bias towards Owens being one of them, to me. I could settle for a Owens, Swihart/Vazquez, Bradley, and any of the OF'er package. The Cubs are loaded with big time prospects, from Javier Baez, to Addison Russell, to Arismendy Alcantara who play up the middle. They also have Starlin Castro already there. The ability to get a minimum of one of these guys in a deal has to be there. Next is the logjam at third base for the Cubs moving forward. Top prospect Kris Bryant is a third baseman, as is Mike Olt, a player the Phillies have long coveted from his times as a Rangers top prospect. The Phillies could reasonably get one of these two as well. The Phillies will want Aroldys Vizcaino or Jorge Soler in this deal. Both have made it up to the big leagues now, and would be tough to get. 20 year old Albert Almora, an OF'er, did struggle a bit in AA this year, but could be an option, as could C.J. Edwards, a righty who just had a strong AFL season. Right-hander Pierce Johnson and first-baseman Dan Vogelbach could be options for the Phillies as well. My ideal deal would bring Russell, Olt, Almora, and Johnson to Philadelphia. My sense though is that Chicago won't rush into that deal early in the off-season. I would have wanted to start this deal for Shelby Miller, but that is no longer an option. Carlos Martinez is now the top arm available here, and has a big league season under his belt. Marco Gonzales wouldn't be a bad pick either. Stephen Piscotty would be the top target for the Phillies positionally, especially coming off of a good year in AAA ball. He would almost have to be in this deal. Alex Reyes, a fire-baller, and Tim Cooney, a control freak, are both decent options to look at. Rob Kaminsky is also an option here. Randal Grichuk and Charlie Tilson could be options as minor league outfielders go, but for that matter, the Phillies have always liked both Bourjos and Jay from their big league roster. My ideal deal is Piscotty, Martinez, Reyes, and Grichuk, but my guess is that if you got the first two, you're looking at Bourjos and one of the rest. This deal would start with either Dan Norris or Aaron Sanchez, both of whom reached the bigs at age 21, after advancing several levels through the minors. It's a matter of whether you want a lefty or a righty at the top of this deal really. Next would be outfielder Dalton Pompey, who also reached the big leagues after advancing across several minor league stops. While very young, catcher Max Pentecost and pitcher Jeff Hoffman have tremendous upside and would interest the Phillies. Sean Nolin and Kendall Graveman are both MLB ready starters, and the Phillies have been linked to Nolin before. I'd be looking for Norris, Pompey, Pentecost, and Nolin from Toronto, which is a steep haul for them, given their reliance on home-grown talent. We'd probably have to throw someone else into this deal to make it work. Another team who's been linked to interest lately, they have both a solid system and a young team. They have a log-jam in the middle infield, with 2013 All-Star Jason Kipnis (just 27) coming off of a rough season, Jose Ramirez having taken over the job at short, and top prospect Francisco Lindor at short in AAA. One would have to be in the deal. Outfielder Bradley Zimmer was the 21st overall pick in last year's draft, and could be a piece the Phillies want, as could Mike Papi, another high pick last year. Lefty T.J. House would most likely have to be in the deal. Cleveland won't want to part with Justus Sheffield. Catcher Francisco Mejia and first baseman Bobby Bradley are very young, but show promise. Clint Frazier is also young, and rates out even better. Ramirez or Kipnis, Zimmer, House, and any of the kids would make a nice package.